Earlier this week in Dallas, I did a session for Frito/Lay (as part of EggStrategy's week long event for FL's Innovation Team) at a luxury suite at Texas Stadium, home of the Dallas Cowboys. It was a lot of fun. The place still had a game buzz: the Cowboys had defeated the Houston Texans the day before. Some of the breakouts were in the locker rooms (yes, the Cowboys' locker was much nicer than the visitor's locker room, and yes, both still smelled). There were signs from the NFL Commissioner warning against betting, and for proper game attire. 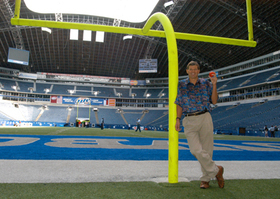 Afterwards, I went on to the field. What a kick! It's a "crowned" field (rises in the center and slopes off at the side lines). 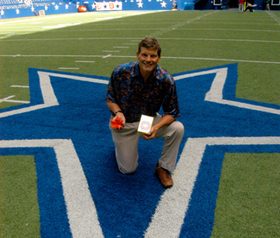 And, of course, I had to do a "T.O" (Terrell Owens), that is, stand on the Cowboy Star at mid-field with my trusty Ball of Whacks (turned into a Star shape for the occasion). It was a kick looking up through the top (the place "where God looks in"). Hi Roger, I am from the Philippines and I really like the concept of the Ball of Whacks. Unfortunately there are no local suppliers here, not even for any of your books. Right now, I am gathering some friends who would also like to buy your products so that we can order from Amazon and save on shipping costs. Looking forward to having the ball!